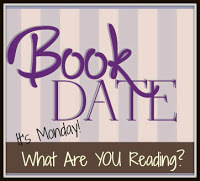 Book By Book: It's Monday 4/23! What Are You Reading? I'm back after a week's hiatus. My husband and I took a camping trip to Virginia last week. We went south seeking warmer weather, but it was still pretty cool! We did get some nice days in the second half of the week, though. We enjoyed hiking, kayaking, campfires, exploring a few small towns...and reading! It was very relaxing and just what I needed. Now, I am feeling refreshed and ready to tackle real life again. But I have over 500 e-mails to wade through, so if you left me a message or are waiting for a reply on Facebook or Twitter, just be patient! I finished Before We Were Yours by Lisa Wingate for my neighborhood book group, and we had a great discussion (my review is at the link). Its premise is based in real life - an illegal adoption ring in Tennessee in the 1920's through 40's that stole poor children from their families and arranged expensive adoptions. How have I never heard of this before? The novel, which tells the story from several perspectives (including the children involved), moving back and forth through time, was captivating. Almost everyone in my group liked it (we had one dissenter!). Now, I am reading The Anatomy of a Miracle by Jonathan Miles, another Booktopia selection (just 2 weeks to go!). It's a novel written as if it were an in-depth investigative report of a true story, about a young man on the Mississippi Gulf Coast who was paralyzed in Afghanistan and suddenly just stands up from his wheelchair and walks. The book delves into many different aspects of the story - his doctor at the VA, the Catholic church's investigation into whether this constitutes a miracle, a reality TV show made about him, and the backstory of his life before. It's been good, and I'm enjoying it (almost finished). I finished listening to the middle-grade audiobook Refugee by Alan Gratz, which follows the lives of 3 refugee children from different times in history: a Jew escaping Germany in the 1930's, a Cuban seeking refuge from poverty in the 1990's, and a Syrian caught in the midst of war in 2015. I have loved the other Gratz novels I've read - Code of Honor and Projekt 1065 - and this one was even better, riveting and powerful and a unique look at the refugee crisis. On our trip, my husband and I started a new audio, The Woman in the Window by A.J. Finn. This one's been getting a lot of buzz, and since my husband likes suspense, I saved it to share with him. It's sort of a modern version of the Hitchcock movie Rear Window. In this case, it features a woman named Anna with agoraphobia who hasn't left her house in 11 months. She amuses herself in part by watching her neighbors from her window, and one day she sees a horrible crime. She tries to report it to the police, but the people involved deny it happened and no one believes her, due to her unstable mental condition, loads of medications, and a heavy drinking habit. Lots of suspense over whether it really happened or not! We are almost finished with it and enjoyed it. My husband, Ken, moved onto the third book in the sci fi classic Foundation series by Isaac Asimov, Second Foundation, after finishing Foundation and Foundation and Empire. He enjoyed re-reading these classics from the 1950's. Now, Ken has started a novel I gave him for Easter (books for all occasions here! ), Fifty Mice by Daniel Pyne. It's a thriller with an intriguing plot: a man has been put into Witness Protection and moved to a community on Catalina Island in CA, but he doesn't remember what dangerous information he knows. Movie Monday: Ready Player One - a fun adaptation of one of our favorite books! Summary of Books Read in March - a great reading month! I have Woman in the Window on my list ... maybe I'll go audio! Sounds like a great trip. It was great on audio! We love a good road trip with an audio book! I am not sure what to read next. I think I'm in the mood for YA though and only have a couple on my shelf from which to choose. Come to my house, Helen! I have a whole shelf - with double rows and extra books piled on top - of YA books waiting to be read. Suppose I should just get rid of some of them at this point, but they all sound so good! I’m especially excited to hear what you shared about Refugee! I have this one checked out and I’m eager to dive in soon. Before We Were Yours has popped up on my radar before, so I need to check to see if that’s already on my TBR list. Thanks so much for sharing! Have a great week, Sue! Both were great, Shaye - hope you enjoy them, too! Refugee review coming soon! You read to listen to Prisoner B now by Gratz. I LOVED it and Refugee. Oooh! Another Gratz! I hadn't heard of that one - thanks! Such a moving book and such an intriguing approach! I’m glad you had a good vacation. I’m hopefully going to be reading Refugee soon, so it’s good that you liked it. Have a great week! Such a good book - hope you enjoy it, too! oh, boy!! I told my husband when he got home from work yesterday - that would be great! I would love to visit Virginia because I believe its a strong quilting area. Before We Were Yours is one on my radar, I'd listen to it if I read it. Hmmm...I entered a comment but it disappeared? This one showed up, Patty, so try again! Sue Refugee sounds great! Have a great week! It was! Thanks - you, too!